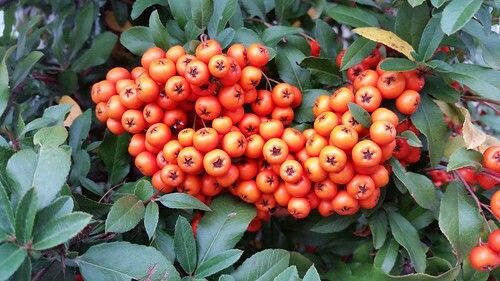 A bunch of orange berries on a bush. I'm relying on my naturalist friends to tell me more about these fellas because I don't think I've ever seen them. I came across them on the day after Halloween which is probably why their bright orange grabbed my attention from a few feet away when I might otherwise not have been primed to pay attention. Thye look like little tomatoes the size of blueberries and seemed to be much firmer. The contrast of vibrant orange and dark green was striking and demanded a photo to be snapped.